Alpha-2-macroglobulin (A2M) is the biologic treatment for your arthritic knee that you are carrying around in your own bloodstream! It’s true! Your body creates a very large protein in your liver which is carried via your bloodstream to your various organs and has several important roles to keep you healthy. The protein is called alpha-2-macroglobulin (A2M) and is among the largest and heaviest proteins that your body makes. It is a naturally occurring plasma glycoprotein whose principal activity is to counteract the protein/enzymes called proteases that breakdown various chemicals and molecules no longer needed in your body in a well-balanced chain of events that keeps you healthy. In a tremendous breakthrough, scientists at the Cytonics, Corp. have discovered that this very large protein can capture and neutralize the proteases created in an arthritic joint that cause the destruction of the articular cartilage. By reducing these destructive substances, it effectively halts the progressive damage seen and felt in the osteoarthritic joint. For those of us involved in the care of the arthritic patient, this is really a huge advancement! Severe OA in knee at surgery. Complete destruction of articular cartilage. Before explaining this wonderful new treatment further, let’s first put the problem of osteoarthritis (OA) into perspective. The Centers for Disease Control estimates that some 27 million adult Americans are afflicted with osteoarthritis. Furthermore, it is estimated that 1 in 2 adults will get symptomatic knee osteoarthritis in their lifetime. With the combination of the aging Baby Boomer population, increased longevity of U.S. citizens and the obesity epidemic, the rising prevalence of OA is expected to contribute even more heavily to the severe health and economic effects already present. Osteoarthritis often causes weakness and disability, interferes with work productivity, and often results, ultimately, in joint replacement. Disappointingly, we currently only have treatments that try to alleviate the pain symptoms of osteoarthritis…..NSAIDS, aspirin, Tylenol®, cortisone injections, viscosupplementation (Synvisc®) and so on. None of these treatments is actually disease-altering or what we would think of as a “biologic treatment” of osteoarthritis. In addition, we encourage weight loss, exercise and activity modifications to deal with the fluctuation of arthritic pain that occurs in our joints. What we have not had available so far is a true biologic treatment that alters the course of eventual destruction of the arthritic joint. A treatment that actually halts the progression of deterioration of the articular cartilage, which when finally worn completely away leaves us with little to do but to consider a surgical solution such as joint replacement surgery. What we have been looking for is a true biologic treatment of osteoarthritis that effectively stops the deterioration of the joint. We have found it in alpha-2-macroglobulin! Not to get into the weeds too far on the biology of osteoarthritis, but it is necessary to understand, at least superficially, the process of osteoarthritis which, as we in the scientific field understand, involves a process of “turning on” or up-regulation of various catabolic (destructive) and inflammatory proteins called proteases. This up-regulation process results in a massive production of these highly destructive proteases which directly damage the articular cartilage. How the destructive process is “turned on” remains unsolved, but the collection of these proteases, including cytokines, disintegrins and matrix metalloproteinases, are intensely destructive and over time, if unchecked, will lead to the loss of the protective cartilage covering of the joint and the development of significant and limiting joint pain. A2M has two binding sites to which proteases (E) are captured. This interaction permanently changes the shape of the A2M and creates a condition where the complex can now be broken down and eliminated by the body through natural mechanisms. Circling back around, some very clever scientists have made the connection that A2M has unique and almost miraculous properties, which include a powerful inhibition of cartilage catabolic and inflammatory proteases effectively neutralizing the process that leads to osteoarthritic cartilage degradation and joint destruction1, 2. In other words, it stops arthritis in its track! In addition, another recent study from Brown University has tagged this protein as a “Master Inhibitor” of cartilage-degrading enzymes and proved that it acts not only by blocking activity of the destructive proteases, it actually suppresses gene expression that leads to elevated protease levels in the joint3. The conclusion of this study was that A2M is chondroprotective if present in high enough quantity. Therefore, it has been inferred that supplemental intra-articular injections of alpha-2-macroglobulin diminishes cartilage degeneration and may be a potential therapy for osteoarthritis. In short, if it was possible to get more of this protein into an arthritic joint early in the arthritic destructive process, it is quite possible to at least slow, if not halt, the progression of joint deterioration3, 4. This would be the first truly biologic treatment for a condition that has plagued humanity since antiquity – a truly giant leap forward! As you read above, your liver actually makes a significant quantity of alpha-2-macroglobulin and it circulates in your blood stream in a reasonably high quantity. 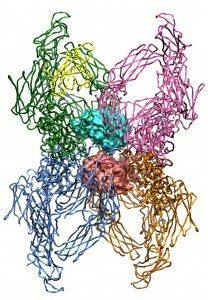 So now, you may be thinking well why doesn’t this protein just end up in the joint and help out? And this would be great… if it could. Unfortunately, studies have shown that A2M is just too darn big of a molecule to cross over into your joint in sufficient quantities to effectively neutralize those destructive catabolic proteins that have been up-regulated (“turned on”) and are destroying your joint.5 If only there was some way to get this miraculous protein from your blood stream into your arthritic knee. Now that would be a real breakthrough in treating arthritis. Well, happy days! The scientists at the Cytonics, Corp. have been spending years trying to develop a method of collecting alpha-2-macroglobulin from the blood stream and providing a relatively simple mechanism of delivering it into your arthritic knee. Just recently, they have perfected a method whereby your own blood is collected and processed with a centrifuge and a proprietary filter which isolates and concentrates your own blood product down to a small portion of highly concentrated A2M that can be directly injected into your knee or any other osteoarthritic joint. In the first roll-out to the public, the Cytonics, Corp. is allowing only selected physicians access to their proprietary process. 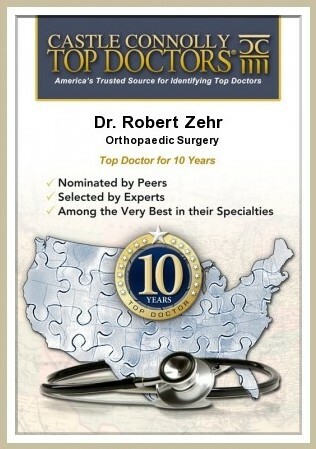 Fortunately, Dr. Zehr is one of the selected physicians and we are doing the “APIC PRP” procedure at the Zehr Center for Orthopaedics! We have chosen to name this procedure, when done at our office, The PLATELET PLASMA “PLUS” or the “PPP” shot for osteoarthritis of your knee to signify that it is in the FDA-designated category of Platelet Rich Plasma, but is truly more of a specialized protein “PLUS” injection. Again, this is truly unique among the others of this classification. A few words of note!!! 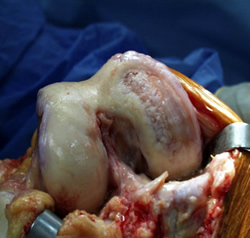 This biologic treatment works best in joints where the destruction has not reached the point of total destruction, or where the joint is “bone on bone.” This is referred to as “end stage arthritis.” A biologic treatment that is designed to help “slow” or “prevent” further destruction will have little effect when the destruction of the articular cartilage has become extreme. This would be analogous to calling the fire department after your house has burned down. 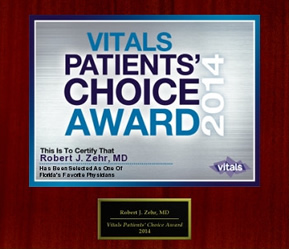 This treatment is FDA-approved for the treatment of mild to moderate osteoarthritis. This new treatment is not the “platelet rich plasma” or “PRP” concept that has been available through many companies for over a decade and is typically used in the sports field and for tendon injuries. In fact, a high concentration of platelets is quite inflammatory to a joint and will not be beneficial. Several studies and the Academy of Orthopaedic Surgeons have recommended against the use of “PRP” in osteoarthritic joints, describing it as not helpful or flat out useless6, 7. 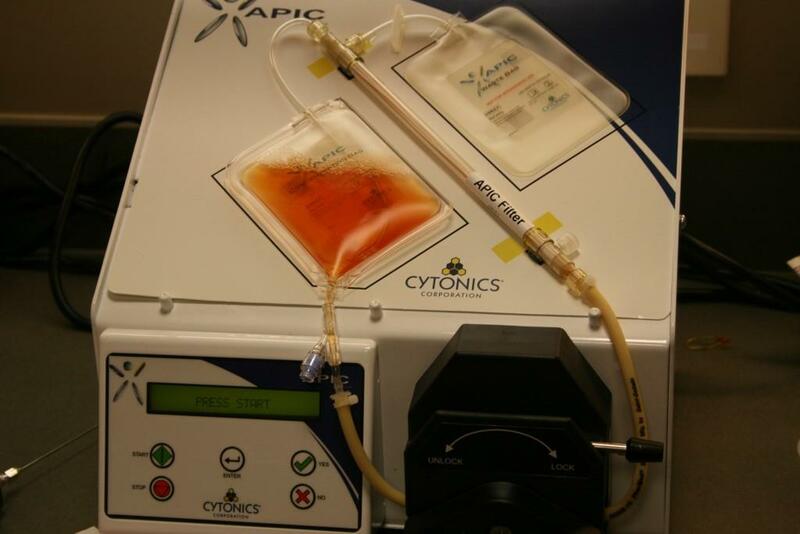 The “APIC PRP” system referred to here minimizes platelet and white cell concentrations while maximizing the concentration of the desired chondroprotective protein alpha-2-macroglobulin. This is wholly unique in the populated field of PRP systems currently available. Payment of A2M is NOT covered by Medicare, nor by the typical commercial insurers. As a result it will need to be paid for like a supplemental treatment. As a note, PRP is not covered by these insurers currently, nor are most of the viscosupplement treatments. If this cutting edge therapy appeals to you, contact our office directly to set up an appointment to see if you are a candidate for this unique and “tip of the spear” biologic treatment of your arthritic knee joint. Browning S, et al. ; Chondroprotective effect of alpha-2-macroglobulin (A2M) on bovine cartilage explants. Data on file with Cytonics, Corp.
Tortorella MD, et al. ; alpha-2-macroglobulin is a novel substrate for ADAMTS-4 and ADAMTS-5 and represents an endogenous inhibitor of these enzymes. J Biol Chem 2004; 279:17554-61. Wang S, et al. ; Identification of alpha-2-macroglobulin as a master inhibitor of cartilage-degrading factors that attenuates the progression of posttraumatic osteoarthritis. Arthritis Rheum 2014; 66:1843-53. Cuellar JM, et al. ; Is there a chondroprotective effect of autologous protease inhibitor concentrate on an osteoarthritis rabbit model? A pilot study. Data on file at Cytonics, Corp.
Woolley DE, et al. ; Small molecular weight ?1 serum protein which specifically inhibits human collagenases. Nature 1976; 261:325-7. Malavolta EA, et al. ; Platelet-rich plasma in rotator cuff repaira prospective randomized study. Am J Sports Med 2014, Aug. Publ online. ClinicalTrials.gov. Serum and synovium protease inhibitor levels in primary and secondary osteoarthritic joints. http://clinicaltrials.gov/show/NCT01613833. Accessed Sept. 2014.